Astronomy binoculars make for a great alternative to telescopes. They are generally smaller, more portable, easier to use and cheaper. Many recommend starting out with binoculars before investing in a telescope if you are a beginner getting into stargazing. This can be great advice and a good pair of astronomy binoculars will increase the number of stars you can see from a few thousand with the naked eye to several hundred thousand and even some deep sky objects. Below are a number of great binoculars for stargazing that you can buy. These are the most popular and high-quality models available from reliable manufacturers like Celestron, Orion, and Nikon, that will give you what you need in terms of performance and ease of use. 3.2 What can you see with astronomy binoculars? 3.3 How to use astronomy binoculars? 3.4 What do the binocular specifications mean? What do I need for stargazing? 3.5 Do I need a tripod for astronomy binoculars? 3.6 Can I take photos through astronomy binoculars? 4. Vote: Which brand makes the best binoculars for astronomy? 5. Conclusion: What are the best binoculars for stargazing? 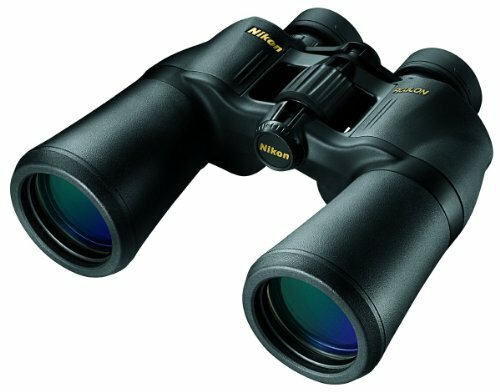 If you are looking for a good pair of 10×50 binoculars for astronomy then this Nikon model is a great option. They are made by camera manufacturer Nikon, who pride themselves in producing high-quality equipment that lasts a long time. The 10×50 magnification will enable you to see the moon in more detail and many more stars in the night sky, however these are not specialist astronomy binoculars and you won’t be spotting planets or deep-sky objects like galaxies. Think more of a low-cost all-rounder that you might like to have around the house and take on trips rather than a serious piece of astronomy equipment. These Nikon binoculars have multicoated eco-glass lenses that give bright and clear images in most lighting conditions, turn-and-slide rubber eyecups to allow for comfortable viewing during long sessions, and a rubber-armored coating gives a non-slip grip, even when wet. The smooth central focus knob makes these binoculars simple to operate and easy to focus. The premium quality also means that when fully zoomed in the view remains crystal clear, which is something you may lose with a budget option. There are also other good (more powerful) Nikon models available – including the 16×50 Aculon. This is the first model in this list that are specialist astronomy binoculars from a known astronomy brand (Celestron – who make high-quality telescopes and other equipment). 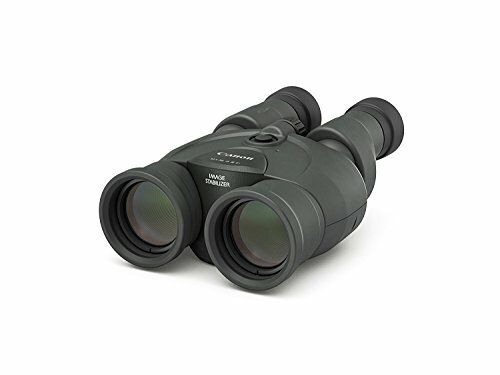 “Giant” binoculars are defined as those that magnify the view 10 times or more and have 70-mm or larger front (objective) lenses and Celestron’s 25×70 SkyMaster binoculars are one of the leaders in the low-price giant binocular arena. Celestron has designed this model to meet the demands of extended astronomical or terrestrial viewing sessions and the 25×70 version is one of the most popular models in the Skymaster series. They offer large aperture light gathering and so open up more stargazing opportunities and are relatively light but include an adapter so they can be used with a standard camera tripod. 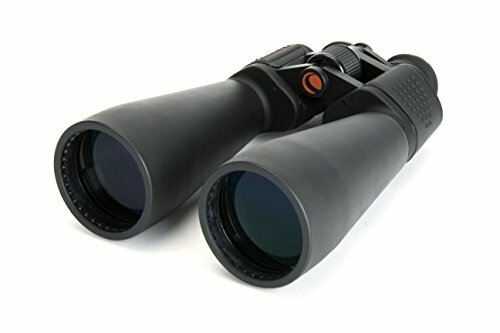 Eye relief on these Celestron binoculars (the distance you hold your eyes away from the eyepieces to see the full field) is 18mm, which is a good distance for higher power binoculars and compatible for glasses wearers. These are great value for the price with the only downside being that the outer 25% of the field of view can be a little blurry. The trade-off from above model is a smaller field of view which is greater with the 15×70 binoculars when using by hand, but for astronomical you will need to use a tripod anyway. This model has an adapter to attach to a standard camera tripod – just make sure you get one that is high enough for your height so that you don’t need to stoop too much when using. Orion are also a renowned manufacturer of astronomy equipment like Celestron. 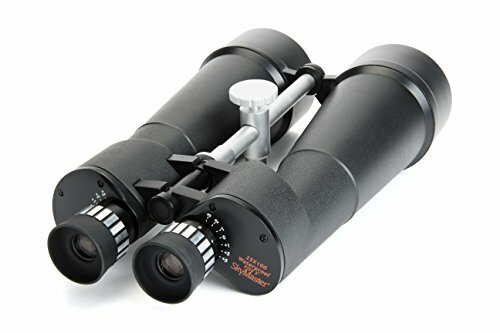 These 20x magnification astronomy binoculars with 80mm aperture lenses are high-powered astronomy binoculars and at this power, the planets and their moons are viewable as well as star clusters and deep sky objects. 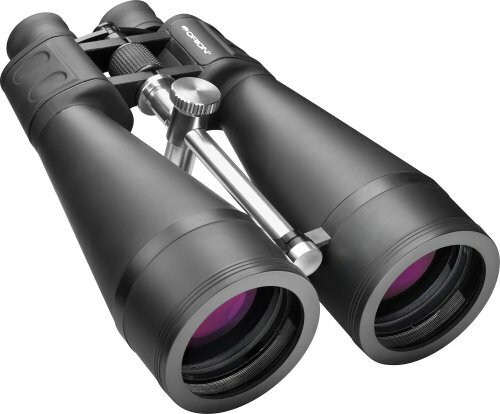 These Orion binoculars have fully multi-coated optics and BAK 4 porro prisms. The eye relief is 17mm which makes for comfortable viewing (even for glasses wearers). They are heavy and so will need to be used with a tripod and the adapter to fit a camera tripod is in-built. These are premium astronomy binoculars offering serious stargazing power. They are powerful with 100mm objective lenses and 25x magnification. With binoculars at this level they are offering as much as top-quality telescopes and will bring galaxies and deep-sky objects into view. They have BaK-4 prisms and multi-coated optics as well as individual eyepiece focus to ensure optimal focus position. The body of these Celestron binoculars is water-resistant and they come in a padded carrying case for travel and safe storage. These binoculars are really heavy at 8.75 pounds and so handheld use is not really an option. You will need a sturdy tripod that has the capability of holding something that weighs this much. These binoculars have a tripod adapter inbuilt – so no need to buy that separately – but you need to make sure your tripod can handle nearly 9 pounds of weight. Their weight may mean that you need to look at getting specialist astronomy binocular tripods, like the Celestron Heavy-Duty Altazimuth Tripod. These Canon binoculars offer something different from the above options because of the image stabilization function. This means that they minimize any shake and are much easier to use by hand – you just push the image stabilization button and the shaky image steadies. This means that for casual stargazing and astronomy, they can be used without a tripod. Compared to some of the above models, they are less powerful and less specifically-tailored towards astronomy, but they offer something different that might appeal to many in being more “grab-and-go” and also being better suited for regular sight-seeing or other uses you may have for binoculars. Binoculars make a great alternative to telescopes for astronomy and in many ways are easier to use whilst offering similar viewing capabilities as they are generally smaller, more portable, easier to use and cheaper. Many recommend starting out with binoculars before investing in a telescope if you are a beginner getting into stargazing but there are also many great telescopes available for beginners. If you want to also consider telescopes, then check out our article on the best telescopes to buy. A good, basic pair of binoculars for astronomy (for example, with 10 x magnification) will enable you to see hundreds of thousands of stars, the moon and the planets of the solar system. A premium pair of specialist astronomy binoculars (for example, with 20 or 25 x magnification) should give you the capability to go beyond this and see deep sky objects (far off galaxies and nebulae). This will require some practice and learning though. Binocular specifications are based on magnification (power) and the diameter of its aperture in millimeters. For example, a pair of 20×60 binoculars have 60mm lenses and a magnification of 20x. For astronomy needs you should get at least 10×50 – these binoculars balance power with portability. More powerful binoculars of 15×70 or 20×80 are also great, and will provide more power but will be heavier and may require the use of a tripod (not necessarily a bad thing but you should just think about what works best for you in terms of power vs weight/portability). To get the most out of heavier, specialist astronomy binoculars then you will need to use them with a tripod. This is because you will be using them like a telescope – targeting objects in the sky with the binoculars staying fixed in one place. 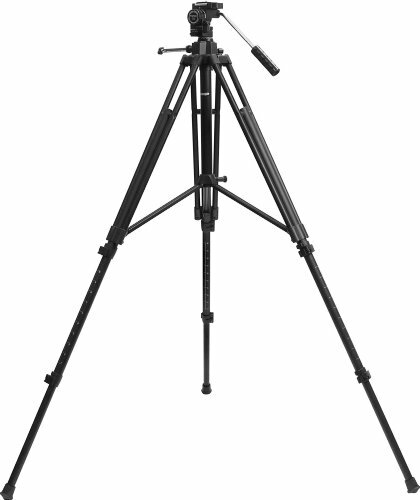 Orion and Celestron manufacture their own tripods but a regular camera tripod should work with your astronomy binoculars. Some binoculars have the adapter to fix them to a tripod built in, but for others you may need to buy an adapter. You can get a Celestron tripod adapter for binoculars here, and from Orion here. See also our article on the best tripods. Astrophotography is with binoculars can be done with an adapter to attach your smartphone to the eyepiece of the binoculars. In this situation, you will need to be using the binoculars on a tripod to keep them steady when the image is being taken, especially since you may need to take a long exposure to get the picture. When thinking about buying binoculars for astronomy you should consider how much use you will get out of them, as well as issues such as the weight, which might not be that obvious but will have an impact on how you use them. If you are after some low-cost stargazing binoculars that you can use by hand then the Nikon Aculon binoculars and first Celestron Skymaster option in this list are your best bet. They provide good stargazing power at good value and can be picked up and transported with relative ease. For the more serious astronomer that wants more power, is prepared to invest more and use a tripod then the last two Orion and Celestron binocular models on this list are recommended. Lastly, the Canon binoculars on this list offer a great alternative if you are looking for a multi-purpose option for more than astronomy. This article was originally published in January 2018 and has been updated for October 2018.